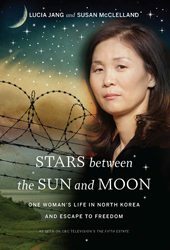 Few memoirs are as harrowing as Lucia Jang’s, about her life inside – and eventual escape from – North Korea. Written in collaboration with investigative journalist Susan McClelland (author of the bestseller Bite of the Mango), the book traces Jang’s unlucky childhood and even unluckier early adulthood – both rife with poverty, violence, and desperation. It’s overwhelmingly bleak, yet utterly riveting. Jang was born in the 1970s, into a postwar, ravaged, heavily militarized North Korea deep in economic crisis. Jobs were menial and in short supply, food was rationed, and Kim Il-sung, ruler of the Workers’ Party of Korea, was deified. A good citizen memorized and followed his edicts, which included never leaving North Korea. Those who did leave were seen as traitors, and since two of Jang’s relatives had defected to South Korea decades earlier, Jang’s family was subjected to heightened surveillance and fewer promotions within the Party’s workforce. Jang and her sister spend their childhoods locked inside their house for reasons their secretive family won’t explain. And yet, life was easier for Jang as a child. As she enters adolescence, famine sweeps over North Korea. Starvation is at the root of her new hell: an abusive marriage born out of financial crisis, her firstborn sold for a small amount of money and two bars of soap, an escape to China to find food for her ailing parents, being sold into a second marriage, life in the streets. Through all of this, Jang’s survival instincts and intelligence astound. Warmth comes via her relationship with her sister and her mother, and a recurring, beautiful dream that offers a single sign of hope. Meanwhile, Jang’s shift from dutiful believer to tentative skeptic is expertly drawn. Her insider’s perspective sheds light on the conditions that allow such a society to exist and the particular sexism that makes life in North Korea especially intolerable for women and girls.